Soundcrash Productions has announced that its new music venue, echoes, is set to open this weekend (7th July) at 261 Kingsland Road in Haggerston, Hackney. 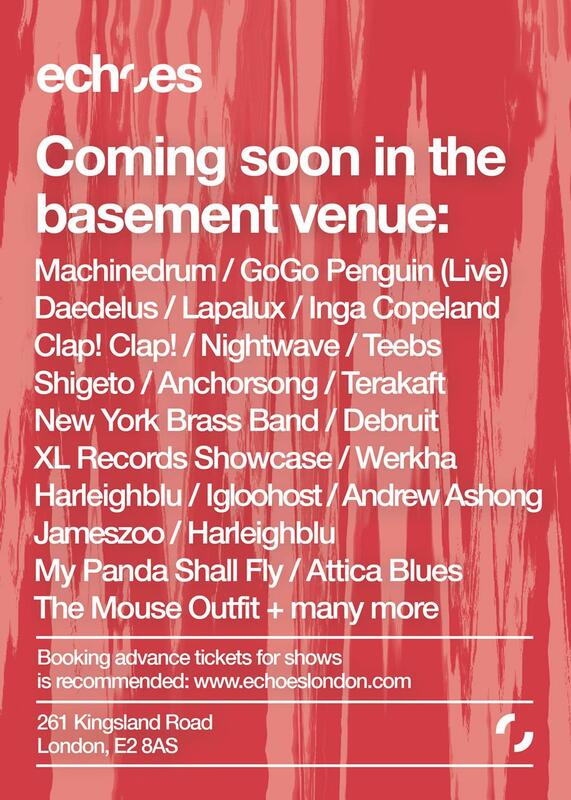 The London-based promoter has already put on a surprise show by Ninja Tune’s Machinedrum at the space, as well as locking in performances from GoGo Penguin (live), Daedelus, Lapalux, Inga Copeland, Clap! Clap!, Nightwave, Teebs, Shigeto and many more over the first few weeks of opening. The multi-use space features a “hideaway bar”, café, and an intimate 100 capacity basement music venue, with what they claim to be “one of London’s best sound systems”, installed by Martin Audio. Over the opening weekend, the café will offer free coffee this Thursday (7th July) and half price beer all evening on Friday (8th July). Going forward, the bar will present Soundcrash selectors on Thursday and Friday nights, with special guest DJs and surprise acts, whilst radio shows from Stones Throw, Tru Thoughts, Ninja Tune, NTS, Browswood, Gilles Peterson, Soulection and more will be broadcast from echoes on a daily basis. You can see a full list of upcoming acts on the poster below, as well as get more details about the venue and buy tickets to upcoming shows through the echoes website.